I got the idea to test my Olympus Pen camera by making pseudo-panoramic multi-frame images when the first Half Baked Half Frame Tour kicked off. I have some test results to share, now, and have learned a bit in the process of making them. A Pen-O-Rama is an attempt to align several frames in such a way that they form a semi-panoramic diptych or triptych (or whatever four or five frames in a row is). 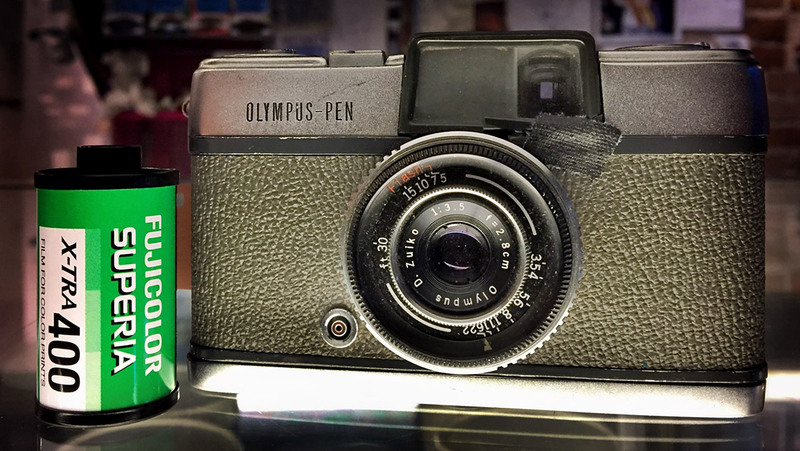 As the name implies, a Pen-O-Rama is done with an Olympus Pen-series camera, though any half-frame camera should work. Panoramas aren’t new, and some of the earliest efforts were the result of multiple images stitched together. In the case of a Pen-O-Rama, the final image is the result of printing an uncut piece of film in which neighboring images are carefully taken so as to give the illusion of a single image broken up by the interstices of unexposed negative between the frames. I haven’t a clue where the term Pen-O-Rama originated, although this post from 2009 on Rangefinderforum.com showcases some really nice examples. I’d be willing to bet it’s older than that, though. The EMULSIVE tour was going to be my chance to try this out, but the tour was short. Unfortunately, the Olympus Pen-D, which was flying around the world between eight photographers, each taking eight shots on the unknown ASA 400 film inside, jammed pretty badly on its way to me in Colorado. I believe I’m on the roster for the second tour, which I hope will be starting soon, so I’ll get another chance to join in the collaborative fun. Maybe the lessons I’ve learned here will help me to better contribute, too. I used my own Olympus Pen, which is much older than the one jetting around for the EMULSIVE tour, for these shots. I figured it would be a practice run, but I didn’t get around to finishing the roll for quite awhile. Mine is the first version of the original Olympus Pen. The serial number indicates it was probably made in March or April of 1960; the second version began production in May of 1960 when manufacturing was moved from a third party factory to Olympus’ own facilities. The first Pens have a 28mm f/3.5 lens that is so flat that it makes most pancakes lenses look more like Belgian waffles. It’s so flat. Really, really flat. It protrudes from the body only 7 or 8 millimeters. As you can see in the photo at the top of this story, the entire Pen is just about as small as it can be and still have room for 35mm film. A Pen-O-Rama must be taken by moving the camera from left to right, or moving the camera in that relative direction if you rotate it to go vertical. Since the image size is half of a normal 24×36 millimeter frame, the frames wind up being portrait orientation: taller than they are wide. If you’re a mostly landscape photographer like me, you’ll be rotating the camera a lot for single shots. The Pen-O-Rama technique is actually a bit easier since each component photo is a vertical slice of the whole scene; you’re just scooting over one frame width to the right each time. The first thing I learned is that you have to choose a subject that is more-or-less directly level with the camera. The lens on the Olympus Pen is wide enough that the distortion from aiming up or down can wreck the effect in some cases. You can cope with some of the distortion by moving the camera laterally to the right as well as rotating it. In the Pen-O-Rama above, the curve of the sign combines with its being above and to the right of the camera position to create such a mismatch of angles between neighboring frames as to be distracting. I also learned that the viewfinder is much too conservative on my Pen. The images it makes are actually much larger than what the brightline guides indicate. I think the photographed area more closely match the entire visible area of the viewfinder, in fact, based on the amount of overlap I see in these examples. Note the location(s) of the parks maintenance truck in the first example above, and the two columns that appear four times. I was very careful when framing to align the right edge of the brightline frame with a memorable landmark or something I could use as a guide, and then align that same thing with the left edge of the brightline for the subsequent image. As you can see, though, there is a lot of duplicated area in the right edge of one image, and the left edge of the next image to the right. The idea, of course, is to get the edges so close to lining up that the combination of the several images looked almost like a single image with a segmented frame placed over it. The illusion, sadly, is shattered somewhat in these examples. Notwithstanding that I need to refine my technique a little, I quite like the effect it produces. One thing I didn’t try — it hadn’t occurred to me until I saw the results of the vertical image above — is adjusting exposure slightly between frames in order to better balance an overall scene with extreme differences in lighting. A final observation: Scanning these was difficult because the un-exposed portions of the film are so black (clear on the negatives, that is) that the scanner software attempts to adjust the exposure with that as the black point. The results is a low-contrast mess that appears grossly overexposed, in spite of the fact that my film looks to have been slightly underexposed on the whole. These examples were all made on a 36-exposure roll of Ilford Delta 100, meaning I got 72 half-frame images which was, frankly, too many. I advise you to stick to 24-exposure rolls, or make up some 15- or 20-exposure rolls if you’re bulk-loading your own cassettes. I’m not a huge fan of the tabular grain of Delta films in the first place, and my HC-110 habit seems to exacerbate it further, so these came out rather too grainy for my taste. I have the Pen loaded with a roll of color negative film now and will be applying these lessons. I’ll have more to share in the future, as well as a more thorough review of the early Olympus Pen itself.